June 2010. 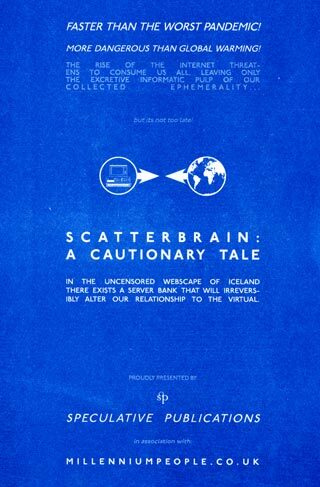 An architectural science-fiction novella, proposing the Internet as an artefact and Icelandic supercomputer. “Wind rushed between the glass branches, whispers echoed and magnified until the Internet spoke with the voice of a hundred glacial waterfalls. It roared down at the rambling figures of Hackenbacker and Graham, as though sensing that their peripatetic presence foreshadowed its own extinction. Vast tracts of the forest had already been shut down, first put into hibernation, and then transitioned into computational winter. The forest had turned by its own seasons, not dictated by the orbit of the sun but by the march of technology, which knew only the rhythm of capital. Every computational spring a new ring of servers had grown up around the hubs, their youth and power sparking new waves of connections, countless electronic synapses. And the particularity of their epoch had been set as an historical datum, a technological marker of our informatic past. In the computational autumn superseded servers were unhooked, and by winter the ground was littered with scrap: dead cores, burntout silicon chips, gold circuitry, plastic and metal plates. The horns of electric tractors reverberated in the dusk, answered by the crackling sound of freed solid-state chips crashing to the forest floor. Over time the basalt was worn smooth by this constant sweeping, as the refuse was bundled into freight trains and sent up valley to the smelters. Eventually these obsolete components had become the raw materials for the computational spring. And so this ancient machine had remained forever young. The metaphor of the seasons did not completely describe the cyclic processes at play – the machine was effectively an ecosystem. It built and repaired itself, ordered its own new parts, and then manufactured them in distant factories. It controlled its own power stations, built new rail infrastructure as required, drove its own trucks, recycled its own components. It regulated its own temperature; unexpected bursts of server activity would cause the vents on its thermal chimneys to all flick open, sending malformed vapour rings rolling over the canopy. It respired. It self-replicated. As it had grown older it had evolved – accumulating junk code in its system, superfluous digital DNA stored in technological backwaters.